"Food Finish is food coloring in a spray can. It turns any humdrum meal into fancy dinner! It comes in a range of sparkly fun colors:Gold, Silver, Metallic Blue, Metallic Red." These awesome fruit and veggie stills are made by Turkish artist Sakir Gockebag. Believe It or Not, none of these images have been manipulated or photo edited! Gockebag creates these striking patterns using organic produce. Ivo Vos is a product and interaction designer, based in London. His latest line caters towards those who prefer their catering, well, catered to. 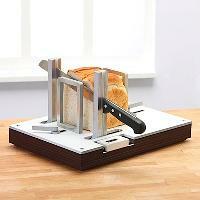 Vos' line, Brunch, is a brunch set specifically designed for those of us who like a little control with our breakfast. Russian artist Arkady Kim recently set a new record when he created the world's largest coffee mural.It required 397lbs of coffee, 5 assistants and 12 days. Kim's dramatic mural-portrait of a woman called Awakening. All of the coffee used to create the work was donated by a Russian coffee company. The mural spans 30 square meters of Moscow's Gorky Central Park. This restaurant is located on top of an active volcano and is sure to get your kebabs grilling nice and crispy. Powered by a flaming inferno that reaches to a deep pit underground, chefs at El Diablo Restaurant rely on their ?kitchen appliance? of choice to never break down. There is reportedly no danger of the semi-dormant volcano blowing sky high. The restaurant has been in place since the 1970?s and serves traditional Canary Islands cuisine. 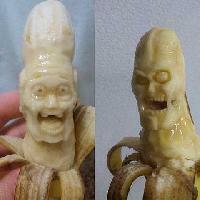 Check out these unbelievable ?banana sculptures. The Zombie banana is especially hilarious if not creepy and there are more to be drawn. Ken Morrish of Colaton Raleigh, Devon, England?was out picking apples in his garden one day when he came upon this very rare two-toned apple. 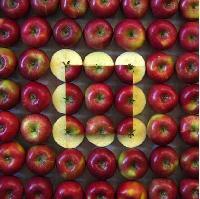 ?Thought to be caused by a genetic mutation, the odds of finding an apple like this are a million to one! Can you believe It, it is Chicken!? Mechanically separated chicken!? Machines here pulverize chicken?bones and everything else left behind after chickens are butchered to produce this pink goop!? It then becomes the main ingredient in processed foods like bologna, salami, chicken nuggets and hot dogs! Fiona Exon recently cracked open 6 eggs from the same box, and all six had double yolks inside, and what are the odds, literally a trillion to one odds. ?Finding one is only one tenth of one percent.